At Above and Beyond Standards, we will focus on producing English Teddy Bear Goldendoodle Puppies with a variety of coat colors to include Cream, Golden, Apricot, Red, Dark Chocolate Brown, Phantom, and Sable. We will produce solids, parti-factor or abstract, as well as Parti English Goldendoodle Puppies! All breeding Dams and Sires are AKC Registered or from AKC registered parents from excellent bloodlines with wonderful temperaments and obtain extensive health clearances. Our breeding goal is to produce beautiful, healthy companion puppies with exceptional temperaments. When purchasing a puppy from us you can be certain the health and temperament of your new puppy is Above and Beyond Standards. We provide all of our puppies with a 2-3 year Health Guarantee to support this. We are proud to be part of this Association that goes Above and Beyond Standards for the Goldendoodle breed. See Our Available English Goldendoodle Puppies!  Above and Beyond Standards English "Teddy Bear" Goldendoodles! "Teddy Bear" Goldendoodles are given that name due to their beautiful boxy "Teddy Bear" heads obtained from breeding English Golden Retrievers to a Poodle. The English Golden Retriever is often referred to by American breeders as English Cream Golden Retriever and European Golden Retriever. The English and American are still one breed and recognized as such to the American Kennel Club. Some differences for the English Golden Retriever include a shorter and more muscular body, lower energy, lower cancer rate, broader muzzle, shorter coat, and coats are lighter in color ranging from cream to gold. 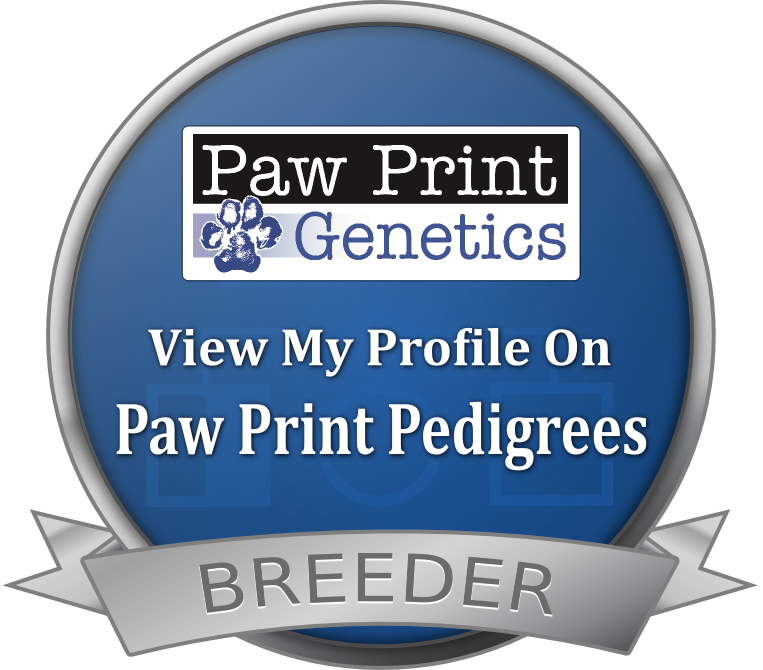 Our Poodle Dams are AKC Registered and from excellent bloodlines. Our English Cream Goldendoodle male is from Champion bloodlines and is GANA Registered. His parents are both AKC Registered. All Dams and Sires have obtained extensive health clearances prior to being bred. All of our Above and Beyond Standards Puppies come with Our 2-3 Year Health Guarantee to support this. A First Generation (F1) Goldendoodle is produced when you cross a Golden Retriever with a Poodle. This combination produces an F1 Goldendoodle. You can cross a Standard Poodle, Moyen Poodle, Miniature Poodle or a Toy Poodle to get different sizes, but this cross is always called an F1 Goldendoodle. An F1B Goldendoodle is produced by crossing an F1 Goldendoodle with a Poodle. These dogs will have a higher success rate for non-shedding, and are recommended for families with moderate to severe allergies. At Above and Beyond Standards, we will be breeding F1B Goldendoodles (F1 Goldendoodle bred to a Poodle) 25% Golden Retriever, 75% Poodle. Coats are loose wavy to curly and mostly non-shedding. Miniature: Height: over 14 but under 17 inches (35cm to 42cm) at wither. Weight: typically 26-35 lbs. Medium: Height: over 17 but under 21 inches (43cm to 52cm) at wither. Weight: typically 36-50 lbs. Standard: Height: over 21 inches (53cm to 63cm) at wither. Weight: typically 51 or more lbs. At Above and Beyond Standards our puppies will typically fall in the Medium to Standard range, but on the Smaller size of the Standard range. The coat of a Goldendoodle can vary from straight, loose wavy to curly. An F1B Goldendoodle is more likely to have a tighter wave or curlier coat, which will have a higher success rate for non-shedding. Goldendoodles can be black, red, white, apricot, brown, cream, Cafe Au Lait, silver beige, silver or blue, and may be a combination of these colors. Goldendoodles carry the color patterns brindle, sable, ticking, abstract, tuxedo, parti, and phantom. For more information, please visit the Coat Types and Color Page of the Goldendoodle Association of North America's website. They have an excellent write-up explaining Colors and Coats. This website in general is a great resource to learn all about the Goldendoodle! The Goldendoodle requires a moderate amount of exercise. Daily walks are a must if you don't have a safely enclosed area for them to run freely. They love games and many are attracted to water and love to swim. Because of the Retriever in them, many of them love to play ball - they will fetch a thrown ball over and over and over . . . you get the picture! The lifespan of a Goldendoodle is typically in the 12 - 15 year range. Goldendoodle puppies look like little teddy bears. As with any dog, socialization and training should start while the dog is still a puppy and continue throughout its life. Look for a puppy kindergarten class locally or join the AKC S.T.A.R. Puppy Program, training based on positive techniques. You do not have to be an AKC purebred puppy to participate in their S.T.A.R. Puppy Program. Find a class here. This is a great place to start socializing and training. A well-socialized, well-trained Goldendoodle makes a wonderful family companion. Early socialization and training establishes those lifetime bonds between the family and puppy as these programs teach you how to communicate with your new puppy and get started on the right foot.